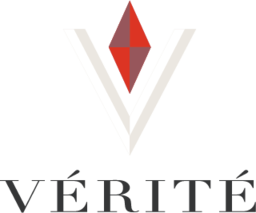 At Vérité we seek, through wine, to give voice to the truth of the soil. We work with a palette of more than 40 different Sonoma County soil types in the region's beautifully diverse micro-crus. We have a deeply personal relationship with all aspects of our craft through an intimate understanding of the details of each micro-cru: the personality of the vines, the character of the block, and the nuances of each bud and tendril. We have this understanding because we let the soil take the lead; we listen to what it has to say. At the beginning of the process, this voice may be small, but with every careful decision made from bud break to bottle, that voice becomes clear. We masterfully assemble everything with the utmost integrity, to bring forth the purest expression of the soil and to create wines without compromise.